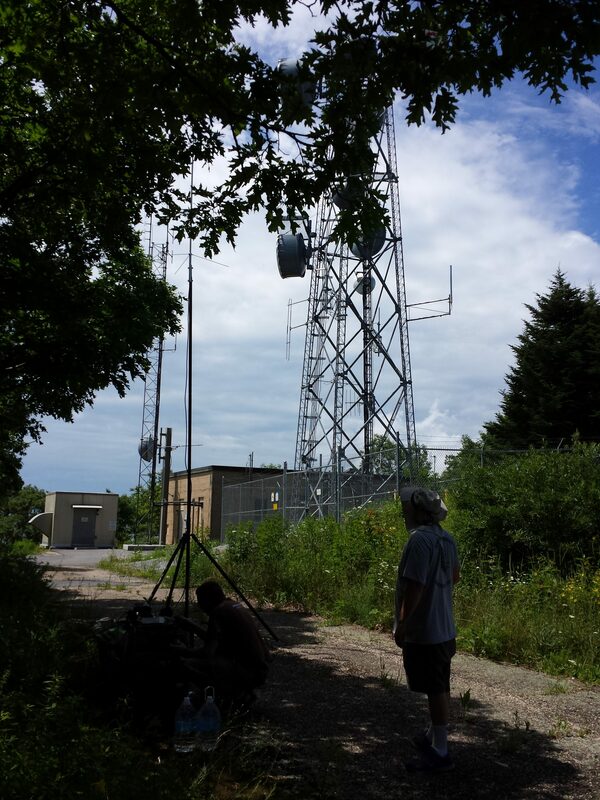 On Saturday, 16 July 2016, Dave KB3RAN, Steve N3IPN, and I hiked up Apple Orchard Mountain (SOTA W4V/RA-001) to activate it for the Appalachian Trail Golden Packet event. While we were there we took advantage of the altitude and activated the summit for Summits on the Air (SOTA), National Parks on the Air (NPOTA), and the CQ WW VHF Contest. Wow, getting to the top isn't easy. First we took way too much stuff. We were, however, prepared for most anything. Suffice it to say we'll be better prepared for hiking and less prepared for anything next time we activate a summit. We were originally hoping that one of the existing tenants on the mountain could have allowed us access by vehicle to the top but everyone was otherwise engaged and so we were left to drag everything up the service road to the top on foot. The service road is a nice, paved road of approximately six-tenths of a mile in length. 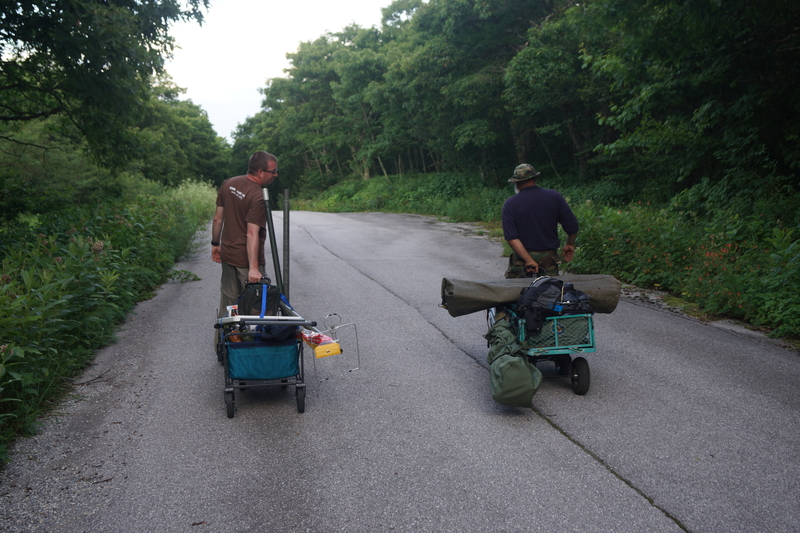 It is grueling carrying a bunch of stuff to the top, however, and it took us around 45 minutes to traverse the distance hauling our wagons. Convenient vehicle parking is available just north of the service road along the Blue Ridge Parkway. Our first priority was setting up the APRS digipeater for the AT Golden Packet event (as AOMTN-5). We were running late so we wasted no time putting the antenna up ~12 feet in the air and powering on the radio. We were rewarded by hearing packets coming through from both Northern Virginia to our north and Comers Rock to our south. Because we had setup the station quickly we didn't get an opportunity to look around and determine if there was a better location for our station. Turns out we were close to the summit but needed to continue a few hundred yards further to reach it. After catching our breath and regaining a little strength we picked up the APRS digipeater, feedline, and antenna and moved it to the summit. I don't think the performance of our setup improved but the views certainly did! There isn't much shade on the summit so it's important to either bring some sort of shelter or move off the summit a bit. Just to the north is a rock pile with several trees growing that could offer some shelter if needed. There is no shortage of antennas on Apple Orchard Mountain. As this is the highest summit in the area, at 4215 feet, so many people want their radio systems up there. One user of concern for SOTA activators is the WA1ZMS 2m beacon on 144.285MHz. Due to the proximity of this auxiliary station the weak-signal portion of the 2m band is likely unusable. We were lucky that WA1ZMS was able to turn off the beacon for the AT Golden Packet event since the frequency used was close to the beacon's frequency. The mission was to link up the Appalachian Trail from Georgia to Maine. Using fifteen digipeaters, we pass messages along the Trail to prove that we can setup an ad-hoc network on short notice. We were successful in seeing sites 3 through 12 this year. We also tested 9600 baud which also worked well. Simplex voice communications were used to help coordinate the event on UHF. We also activated for SOTA, NPOTA, and CQ WW VHF Contest. Conditions weren't great and most of my contacts on 6m and 2m were limited to a few grid squares around. I did manage one contact out to the Midwest but most of my contacts were very much local. It was fun giving out W4V/RA-001 for SOTA and TR01 for NPOTA. I also worked a station that had 432MHz capabilities even though it wasn't for the contest; I'm all about putting the contacts in the log. The antennas used were a Buddipole 2-element 6m yagi and horizontal loops for 2m and 70cm. The radio was a Yaesu FT-857D. Another mission that I was successful in was updating OpenStreetMap data for the area. Updating this information will hopefully provide others wishing to activate the summit with better cartographic information. I haven't talked about Dave and Steve's attempts at activating the summit. In spite of good radios and antennas the contact count wasn't great. Part of the problem was that we didn't have any way of self-spotting on the SOTAwatch2 site meaning that their QRP signals just couldn't be found easily. Hopefully we won't have this problem next time.